No stranger looking at couple's divorce papers can imagine all the disparate emotions lodged between the words of the printed form; love, hate, regret, hope and despair may all have roles in the end of a marriage. Kentucky makes dissolution of a marriage a little easier by allowing no-fault divorce, so slings and arrows are not required. When the court finally signs off on the divorce plan, it all boils down to just a few pages. Those involved or merely curious can obtain certified copies in the clerk's office. After the final forms have been signed and the last arguments made, the judge makes her rulings on disputed issues and your marriage is at last terminated. The document signaling the official end of a Kentucky marriage is form AOC-245: Dissolution of Marriage, Findings of Fact and Conclusions of Law. It sets out the skeleton of the divorce, including the names of the former spouses and their children, as well as the bones of the property division, parenting plan and support payments. Each spouse is mailed a copy by the court. If you've lost your copy of the dissolution of marriage form, or you need another, head to the Circuit Civil Division file desk in the court in which you obtained the divorce. Anyone with the parties' names and file number is allowed to review the file and select pages to copy. The court charges per page for the copies. If you need to get a certified copy of the dissolution of marriage form, expect to pay another small fee. Note that a certified copy of a document is simply a photocopy marked by court officials as a true copy of the document from the court files. Generally, those appearing at the file desk can obtain a certified copy of the dissolution of marriage form the same day. Depending on your situation, you may not need to go through the procedure of obtaining the entire court order terminating the marriage. If you only need to prove that you are divorced, or obtain proof that someone else was divorced in Kentucky, a divorce certificate fits the bill. Marriage and divorce certificates from June 1958 to the present are available from the Kentucky Office of Vital Statistics at 275 E. Main Street in Frankfort, Kentucky. 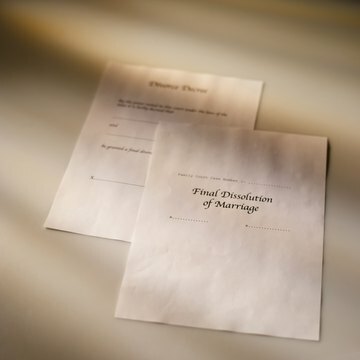 You can order certified divorce certificates from the Kentucky Office of Vital Statistics if you have full names of the parties, the date the divorce was entered and the county where the divorce was granted. You will also be asked for the address to which you want the certificate mailed. You can make the request and pay applicable fees by appearing at the office during business hours. You can also download an application from the website and send it and a check by mail.